This is a hot wallpaper Tate :D Keep up the good work! only thing I would say is that I like the falling text but it looks a little unbalanced compared to the horizontal text...maybe if you spread out the letters more or curved them more? run! ehehe love the style! + the simplistic is the best! love the color combos and of course the cute text too ehehe soo +fav! 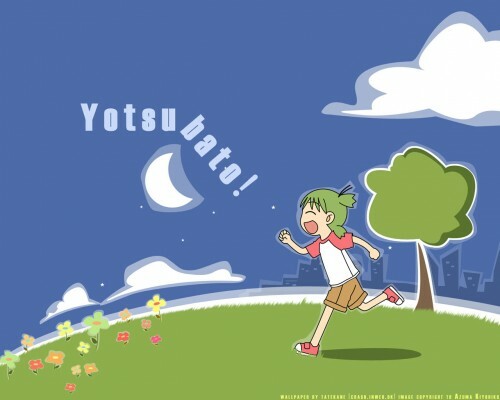 Yay for Yotsubato XD ! Anyway somehow I would have liked an orange sky better, but that's personal. It's clean, perfectly executed and too damn cute for me not using it :) . Thanks! So cute! I absolutely love the style, and the trees and flowers are adorable! Nice job! way cute way good vector everything's great! +fav! AHH! this is the first yotsuba pic. i've seen here...i didn't no MT had any yotsuba pic. anyway...need to say something about the pic. Aww, very cute and kawaii! I really like the colors and this vector is very well extracted! I think the skies are too bright, just like what Jasmine said! >_< But I still love it very much! *adding to favs* Keep up this awesome work and effort!